Paulina shows us the Ukrainian Sport Club behind the pink corridor (a color she doesn’t like) and underneath the room in which the choir rehearses. She shows us Ukrainian restaurants and a butcher who makes the best sausages. She invites us to the Café Venieros, where the cake tastes really good. She studied music in Czernowitz and played in the Bukowina Ensemble for Song and Dance Orchestra. She shows us a picture in a newspaper of what the women in the Ensemble wore. The woman on the front page is wearing a crown on her head made of flowers and berries. This berry could be seen as a symbol of the Ukraine, says Paulina. The berry is called Kalyna. The berries are bitter and sour. After they are made into marmalade, they supposedly work well as medicine. 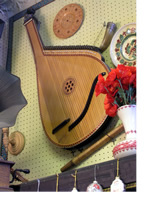 In addition to Kalyna, Bandura, which is a string instrument similar to a harp, should also represent the Ukraine. We can see it in the Ukrainian store, but it’s not for sale.